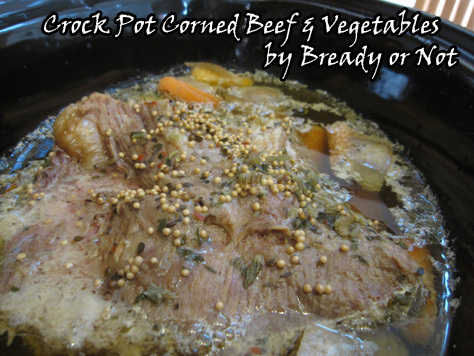 Make your St. Patrick’s Day dinner convenient and delicious with a slow cooker version of corned beef, potatoes, and vegetables. Place celery flakes, onion slices, potatoes and carrots into the crock pot. Trim fat from the brisket and place the meat on top of the veggies. Add 4-6 cups of water to the crock pot until the brisket is almost covered. Sprinkle the brisket's seasoning packet over the top. Put the lid on and cook on high for 4 1/2 hours, or 8 to 9 hours on low. Remove the brisket and slice thinly or pull into chunks. Serve with the cooked veggies.